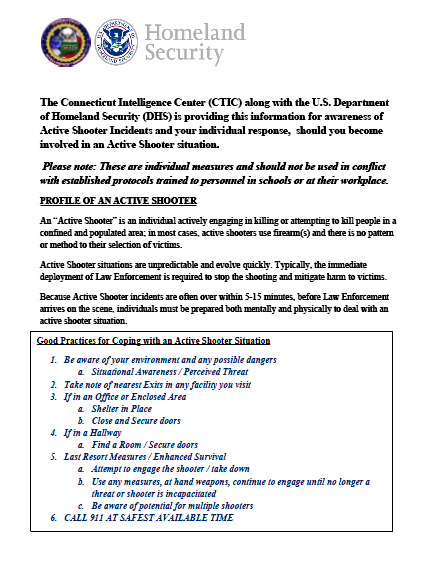 The Connecticut Intelligence Center (CTIC) along with the U.S. Department of Homeland Security (DHS) is providing this information for awareness of Active Shooter Incidents and your individual response, should you become involved in an Active Shooter situation. Please note: These are individual measures and should not be used in conflict with established protocols trained to personnel in schools or at their workplace. An “Active Shooter” is an individual actively engaging in killing or attempting to kill people in a confined and populated area; in most cases, active shooters use firearm(s) and there is no pattern or method to their selection of victims. Because Active Shooter incidents are often over within 5-15 minutes, before Law Enforcement arrives on the scene, individuals must be prepared both mentally and physically to deal with an active shooter situation. Quickly determine the most reasonable way to protect your own life. Remember that customers, clients, students, etc. will follow the lead of employees, staff, or management during an Active Shooter situation. g. Follow First Responders Instructions, Security, Police, etc. If evacuation / escape not possible, find a place to hide where an active shooter is less likely to find you. b. Silence all cell phones, pagers, radios, or other devices, etc. c. Turn off sources of noise such as TVs, radios, etc. d. Conceal yourself behind large objects such as book cases, desks, etc. Arriving Law Enforcement’s first priority is to engage and stop the Active Shooter as soon as possible. Officers will form up and immediately proceed to engage the Active Shooter, moving towards the sound of gunfire. b. Put down any handheld items, i.e. bags, backpacks, jackets, etc. Accurate and relevant information to Law Enforcement is vital for Active Shooter mitigation and can be provided to on scene Police or 911 Call Takers. 2. Characteristics i.e. mask worn, wearing tactical equipment, etc. Arriving officers will not stop to help injured persons, their initial response is to stop the Active Shooter, so be cognizant of this. Expect Rescue Teams comprised of additional officers and other Emergency Medical Personnel to follow the initial response officers. The Rescue Teams will treat and remove any injured persons. They may call upon able-bodied individuals to assist them in removing the wounded from the premises. Once you have reached a safe location or an assembly point, you will likely be held in that area by Law Enforcement until the situation is under control and secure and all witnesses have been identified and questioned. DO NOT leave until released by Law Enforcement Authorities.